A Dose of Vitamin “Sea” is Just What the Doctor Ordered! With fall approaching quickly, there’s never been a better time to get in your vitamin “sea…” with a stay at A Dose of Vitamin Sea 936B at Miramar Beach Villas! 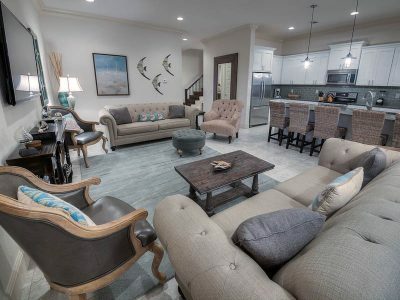 Located just minutes away from Destin’s gorgeous sugar-white beaches in Miramar Beach, this four bedroom, four bathroom townhome sleeps 12 guests. Whether it’s for fall break or a much-needed getaway, A Dose of Vitamin Sea 936B is the answer! On the first floor, you’ll find a spacious living room, dining area, and kitchen. The kitchen comes fully equipped with everything you’ll need during your stay, including a large kitchen island and top of the line stainless steel appliances! The home’s coastal chic decor will have you feeling like you’re at the beach 24/7. A bedroom and a full, private bathroom are also located on the first floor. Then, on the second floor, find the master suite complete with a walk-in shower and dual granite vanity in the bathroom. Two more bedrooms, each with their own private bathroom, are also located on this floor. We have to say, though; the best feature of this home is the outdoor patio. With an outdoor grill and plenty of comfortable seating, it’s the perfect place to curl up with your friends and family while you watch the sunset. Sound like the perfect vacation yet? For more vacation inspiration, check out these other Destin vacation homes and condos for your fall getaway!